Notifications of new articles will be provided, as before, via Facebook and Twitter. 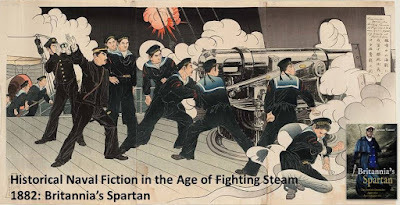 These blog articles will be accessible also through the "Conflict" archive, which now contains some 200 articles, covering naval and other history from the 17th to early 20th Century. Click here to see the listings. The Home page now also includes a search function (magnifying -glass symbol at top right) which is useful for searching for topics on the site and, in particular, the Conflict lists. I hope that you'll enjoy my blogs as much in the new format as in the old! France’s crushing defeat in the Franco-Prussian War of 1870-71, and the added humiliation of the loss of the provinces of Alsace and Lorraine to the newly-proclaimed German Empire, led many French to see acquisition of overseas colonies as a way to restore national pride. A main driver of this policy was the politician Jules Ferry (1832 – 1893) who justified this, as he stated in the Chamber of Deputies in 1885, because "It is a right for the superior races, because they have a duty. They have the duty to civilize the inferior races." The French were, of course, to consider themselves a superior race. This drive was instrumental in consolidation and extension of the French presence in Indo-China, occupations of Tunisia and Madagascar and acquisition of vast territories in West and Central Africa. This policy also led to a major war with China in the mid-1880s and was to remain a source of friction with Britain until the end of the century. 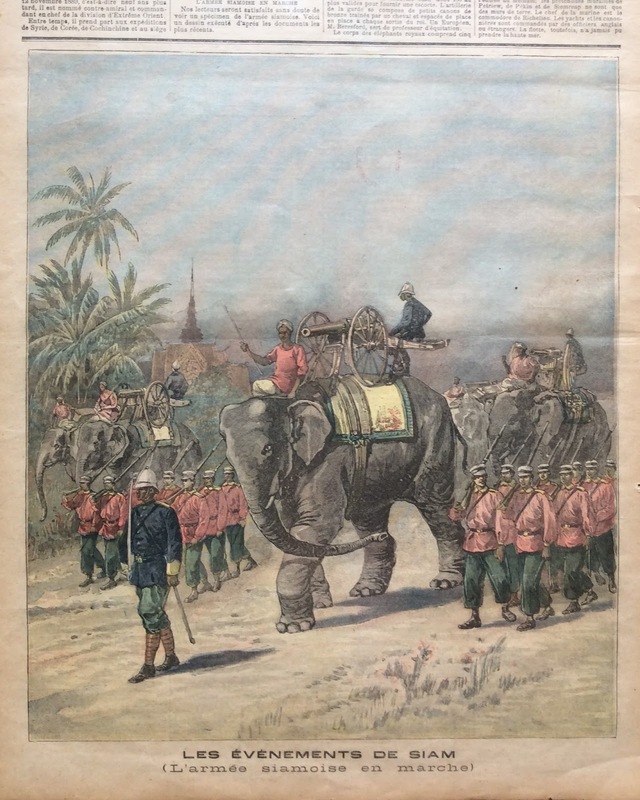 The French presence in Indo-China, which by the early 1890s extended over modern Vietnam and involved holding of Cambodia as a protectorate, inevitably brought about confrontation with the Kingdom of Siam – now Thailand. 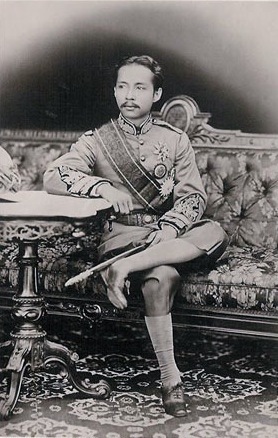 In this period, Siam’s King Rama V (1853-1910) initiated a programme of reforms and modernisation which would help withstand pressure for colonisation by European powers – of which France represented the greatest threat. Up to this time Siam’s eastern and western frontiers had been poorly defined, lying as they often did, in remote and difficult terrain. In due course the frontier with the British possessions of Burma was settled amicably but the problem proved more intractable on the eastern frontier with French Indo-China. 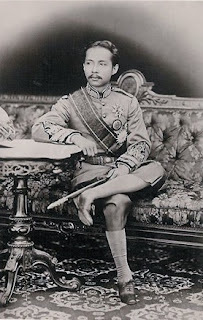 The concern reached crisis proportions in 1893 over control of Laos – where the French already had commercial interests. 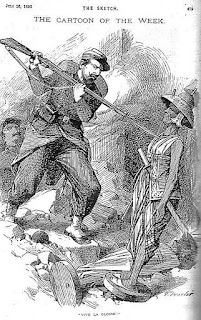 The expulsion of French merchants in late 1892 – on accusations of opium smuggling – followed by a refusal to withdraw Siamese forces from east of the Mekong River, triggered indignation by pro-colonial politicians in France. As a clear statement of intent not to back down, a gunboat, the Lutin, was accordingly sent to Bangkok and moored close to the French legation. The situation escalated in April 1893 when French forces advanced into disputed territory in Laos. Many of the Siamese forces withdrew ahead of them, though some resisted. The occupation was generally peaceful until a French police inspector and seventeen Vietnamese militia men were killed in a Siamese attack on a village on 5th June, an attack allegedly approved of by the Siamese government. This provided the pretext for yet stronger French intervention and a demand for reparations. 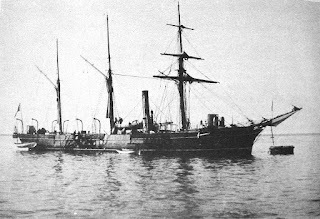 What followed was a text-book example of “Gunboat Diplomacy”, a demonstration of how naval power – even in the form of small, unarmoured units – could be decisive in forcing resolution of disputes. 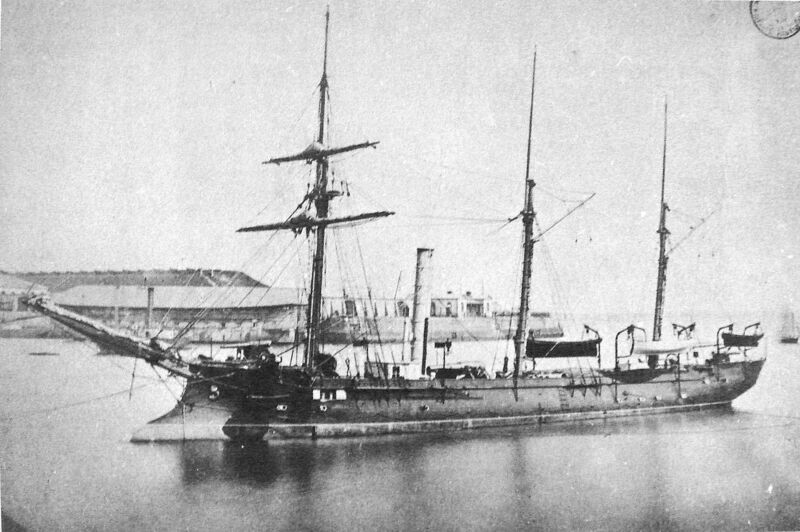 Two small French warships – the sloop (aviso) Inconstant and the gunboat Comete requested permission to cross the bar into the Chao Phraya, the river on which Bangkok stands. Neither was powerful. The Inconstant, launched in 1886, was an 890 ton, 201-foot composite vessel (i.e. a wooden hull carried on iron frames) that carried a single 3.9-inch gun and five one-pounder Hotchkiss revolvers, five-barrelled weapons that operated on the same principle as the Gatling. 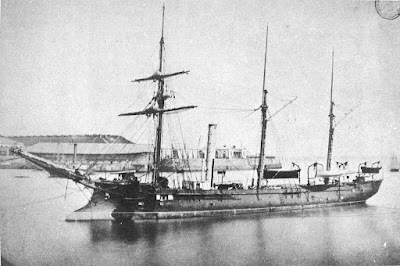 The Comete was of similar vintage, also of composite build, a 490-ton, 151-foot craft with two 5.5-inch guns and three revolvers. The Siamese refused passage but the French commander, a Rear Admiral Edgar Humann, decided to press ahead anyway, in variance with his instructions by the French government not to advance against overwhelming force. The Siamese defences were indeed formidable, the river approach being dominated by the modern Chulachomklao Fort, commanded by a Dutch mercenary, and armed with seven 6-Inch Armstrong guns on disappearing mountings and the navigable channel being constricted by sunken junks. 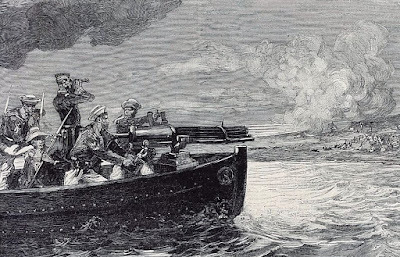 Five Siamese gunboats, commanded by a Dane in Siamese service, were moored upstream of the junks, though only two were modern and of any fighting value, and the defences were strengthened yet further by a sixteen-unit minefield. The French advance commenced at sunset on 13th July – timed, one suspects, to ensure arrival at Bangkok on the following day, the 14th, France’s national Bastille Day. Visibility was limited by heavy rain. Both French warships were under tow by the small mail steamer Jean Baptiste Say. As both Inconstant and Comete were steam driven one wonders if towing was adopted so that the Say could be sacrificed to blow a path through the minefield. The rain ceased as the vessels neared the fort and the Siamese fired three warning shots. The French forged on regardless. 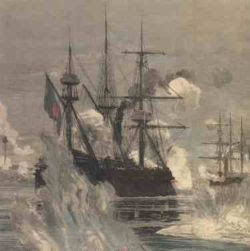 The fort opened fire in earnest and the Siamese gunboats followed suit. Darkness was falling by now and Inconstant returned fired on the fort while the Comete engaged the gunboats. 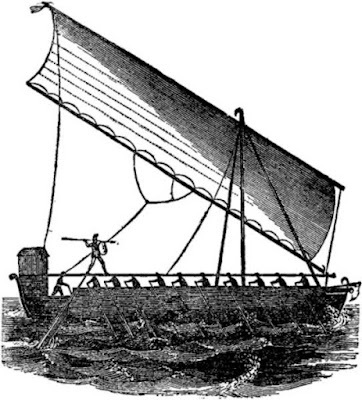 A small Siamese boat filled with explosives was sent out to ram one of the French ships, but it missed its target. It should have been no contest – the six-inch Armstrongs in the Siamese forts had the capability to tear the French vessels apart while the French armament had no hope of inflicting any injury on the masonry fort and its disappearing gun-mountings. French daring paid off however – one is reminded of Farragut in somewhat similar circumstances at Mobile bay. Determination was rewarded as the French vessels smashed through the Siamese line, ramming and sinking one gunboat in the process and damaging another by gunfire. The Jean Baptiste Say was however hit and was forced to cast off its tow before grounding on a nearby island. The minefield appears to have proved ineffective and both Inconstant and Comete drove on upriver to Bangkok and trained their guns on the Royal Palace as a powerful inducement to reach an agreement. 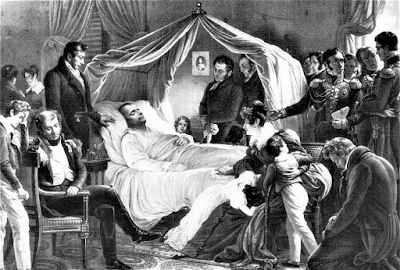 The French had suffered three dead and two wounded, the Siamese many more. There was however a violent postscript. The grounded Jean Baptiste Say was captured by the Siamese and her crew was taken prisoner. 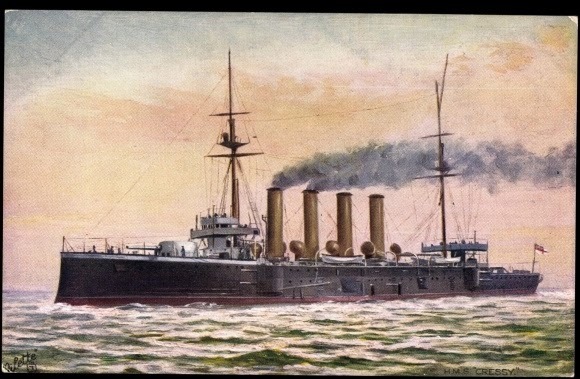 On July 15th another French gunboat, the Forfait, sent a boarding party to recapture the vessel but it was repulsed. This represented the end of active hostilities. With Bangkok essentially blockaded by French forces, as far as maritime trade was concerned, and as French vessels lay off the heart of Bangkok, there was every reason for the Siamese to negotiate. A treaty, highly favourable to the French, and consigning control of Laos to them, was signed three months later. 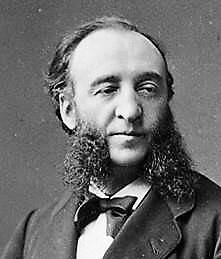 Jules Ferry would have been pleased, though he did not live to see it – he had died on !7th March that year, following an assassination attempt. There have been few more effective – and cost-effective – examples of gunboat diplomacy. 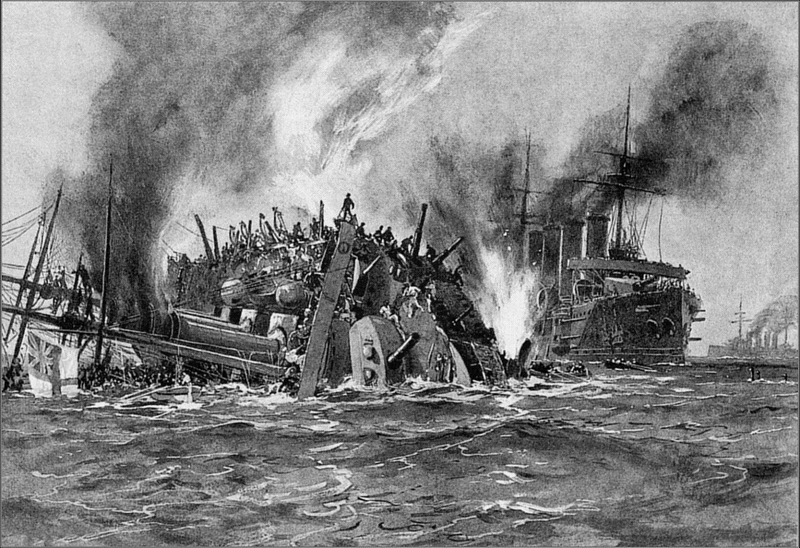 The Royal Navy suffered its first major loss in almost a century in September 1914, a disaster that cost 1459 men their lives and destroyed three ships. The impact on British public-consciousness was massive – comparable to the loss HMS Courageous and HMS Royal Oak in 1939 – and all the more so since it was recognised not only as avoidable, but the result of poor professional decision-making. At the outbreak of war in 1914 all major navies had small numbers of submarines. There was little over a decade’s experience of their employment and designs were largely experimental. Limited range and armament, low speed and, above all, short underwater endurance led many to believe that the offensive threat they posed, especially to warships, would not be great. Fevered development during the First World War was to change such views but in September 1914 many commanders who had grown up in purely surface navies still held to such opinions. The first indication of the submarine’s potential came on September 5th 1914, when the British cruiser HMS Pathfinder was sunk in the North Sea off the Scottish coast. Hit by a torpedo fired by the German submarine U-21, she was to gain the unfortunate title of being the first British warship to be sunk in this way. The Pathfinder was a "Scout Cruiser", a class which was to evolve in time into the Light Cruiser. Launched in 1905, she was just under 3000 tons, 385 feet long and carried nine 4-in guns and smaller weapons. She could make 25 knots top speed but her limited coal capacity was the class's Achilles heel. On the day of her destruction her bunkers were so depleted that she was restricted to 5 knots, making her an easy target for the U-Boat. A magazine exploded within minutes after the ship was hit and she went down with a loss of 259 men from her crew of some 270. The ship was sufficiently close inshore for her loss to be witnessed by many on the coast, including the future novelist Aldous Huxley. In a family letter he recounted in appalling detail what he had heard from members of the local lifeboat about the human remains found when the area was searched. 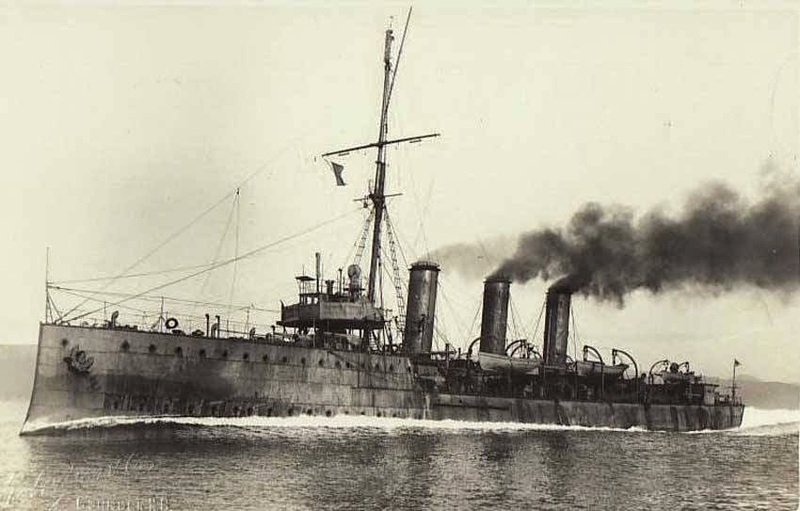 Despite this “wake up call” regarding vulnerability of warships at low speed the Royal Navy initiated a patrol of the northern entrance of the English Channel with five obsolete Cressy class armoured cruisers. This group was known as “Cruiser Force C” and the patrol area they were assigned to was in the shallow waters off the Dutch coast known as the “Broad Fourteens”. The logic of maintaining a patrol in the area was unassailable as a fast German raiding force of destroyers could wreak havoc on British maritime supply lines between the English Coast and Northern France should they enter the Channel. Though destroyers and light cruisers would have been more suited to the task it was believed that destroyers would be unable to maintain the patrol in bad weather and insufficient modern light cruisers were available. The solution was to deploy old armoured cruisers which had at least got the necessary station-keeping capability. This was perhaps their only positive attribute. The vulnerability of these cruisers was recognised by many senior officers, not only because of their obsolescence but because of their manning. Taken hastily from reserve –which meant they had been unmanned and poorly, if at all, maintained – on outbreak of war they were quickly overhauled and put back in service. Originally capable of 21 knots they now found it hard to make 15. 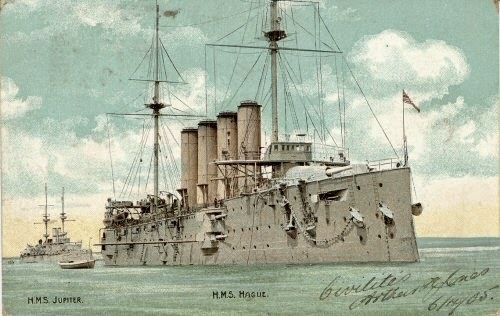 Crews were in short supply, leading the ships to be manned by reservists, many middle-aged, many of them pensioners, who had not previously served or exercised together as units. In addition, nine naval cadets, some as young as 15, were allocated to each ship, being taken directly from the Royal Naval College. The general view of Cruiser Force C’s fighting potential was summed up in the nickname it quickly acquired - the "Live Bait Squadron". 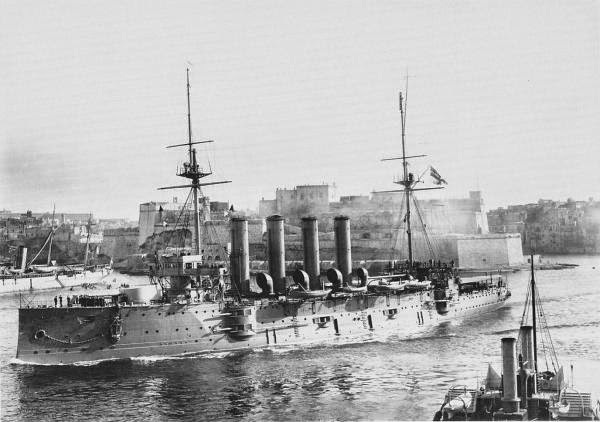 On September 20th 1914 Cruiser Force C’s patrol consisted of HMS Euryalus, HMS Aboukir, HMS Hogue and HMS Cressy, with a fifth vessel, HMS Bacchante in remaining in port. Rear Admiral Christian, in Euryalus, was in temporary command of the force. Poor weather made it impossible for the protecting destroyer force to remain in company and Euryalus had to drop out due to lack of coal and weather damage to her wireless. Christian had to remain with his ship as the weather was too bad to transfer. He delegated command to Captain Drummond in Aboukir . A further step in the path leading to disaster was made when Christian did not make it clear that Drummond had the authority to order supporting destroyers to sea if the weather improved, as it indeed did later the following day. The other main actor in the drama was also moving towards the Broad Fourteens. Kapitaenleutnant Otto Weddigen, in command of the German submarine U-9 – the low number indicting just how early a unit this vessel was in the Imperial Navy’s submarine force – had left Wilhelmshaven on September 20th. His orders were to attack British transports landing troops at Ostend, on the Belgian coast. Though only 32, Weddigen was an experienced submariner and had survived a peacetime accident to the U-3, from which he and 27 others had escaped though a torpedo tube. The U-9 was very primitive by later standards, her surface displacement 505 tons, her length 188 ft. Her heavy-oil engines, of 1040 hp, gave her a surface speed of 13.5 knots. She was armed with four torpedo tubes, two forward, two aft, and carried reloads for the forward tubes only. Her greatest weakness was her heavy-oil engine, which produced a very visible exhaust plume. The same weather that plagued Cruiser Force C battered the U-9 unmercifully – her limited underwater endurance meant that she had to remain on the surface – and her gyrocompass became inoperable. Weddingen attempted to navigate by soundings – a doubtful technique even in the best of circumstances. On September 21st he identified his position as some 20 miles off the Dutch coast at Scheveningen, the port of The Hague. He took his vessel down to 50 ft for the night, stopping his batteries, and resting his crew. At dawn on September 22nd U-9 surfaced to find the storm over, the sea calm but for a slow swell. Smoke was seen on the horizon and the U-9’s engines were immediately shut down to get rid of their exhaust plume. A quick appraisal led Weddingen to order diving but he continues to observe through his periscope. Three vessels were approaching – the Aboukir, Cressy and Hogue – and Weddingen steered on his electric motors towards the central vessel, Aboukir. Undetected, U-9 came within 600 yards of Aboukir’s port bow before firing a torpedo. As this was still running Weddingen took his craft down to 50 feet, then heard “a dull thud, followed by a shrill-toned crash”. Cheering erupted on U-9. The single torpedo was to prove enough to destroy Aboukir. Hit amidships on the port side, the engine and boiler rooms were flooded and the ship listed to port. Assuming that he had hit a mine – even after the loss of the Pathfinder the submarine threat was still underestimated – Captain Drummond ordered Cressy and Hogue to come closer so that Aboukir’s wounded could be transferred. Even had a mine indeed been responsible the order would have been an unwise one, but with the U-9’s presence still unsuspected it was to prove fatal. Attempts to counter Aboukir’s list by counter flooding proved unsuccessful and when it was obvious that she was going to roll over “abandon ship” was ordered. Only one boat got away, the others either wrecked by the explosion or impossible to launch. 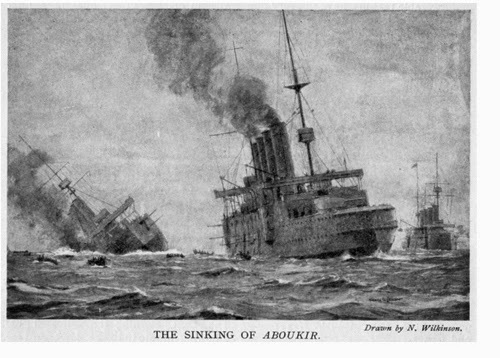 Twenty-five minutes after the torpedo strike Aboukir capsized, remained on the surface, bottom-up, for a few minutes with a few wretches clinging to her, then disappeared. U-9, her presence still unsuspected, observed the disaster through the periscope. Hogue and Cressy were now creeping towards Aboukir’s survivors and lowering boats. Weddingen ordered the empty torpedo tube reloaded and identified Hogue as his next victim. She was now stationary and Weddingen fired both bow tubes at her. This action altered U-9’s balance and her bow broke surface, drawing fire from Hogue. Weddingen managed to get his craft under again and as he did heard two explosions. The Hogue’s end was almost identical to her sister’s and the “abandon ship” order meant leaping into the water as her boats were already busy with saving Aboukir’s survivors. Now only the Cressy remained and she was transmitting distress signals by wireless. U-9’s batteries were almost depleted but Weddingen was determined to continue his attack. Through his periscope he could see the surface strewn it wreckage, bodies, swimmers and overcrowded boats. Cressy was stationary and her boats had been lowered. U-9’s periscope was spotted and the cruiser opened fire, the surged forward in an unsuccessful attempt to ram. Then, unaccountably, she stopped again. Weddingen still had three torpedoes left, two aft, one forward. He manoeuvred to bring U-9’s stern tubes to bear and fired both at a range of a thousand yards. One torpedo struck the Cressy but the second missed. Hit on the starboard side, the cruiser heeled over, then began to right herself. Some ten minutes later Weddigen fired his last torpedo from its bow tube. Now hit on the port side the already stricken Cressy rolled over and remained on the surface, bottom up, for a further twenty minutes. Then she too sunk, her crew’s plight all the worse since the boats she had sent off were already crowded with Aboukir’s and Hogue’s survivors. Two Dutch trawlers had approached initially but bore away in fear of mines. (Note that the Netherlands was neutral throughout World War 1). About a half hour after Cressy went down a small Dutch steamer, the Flora, approached and managed to pluck 286 men from the water. A second Dutch ship, the Titan, rescued 147 more. Two British trawlers arrived and joined in the rescue effort and eight British destroyers arrived from Harwich two hours later. In all 837 men were saved from the three cruisers but 1459 had been lost. 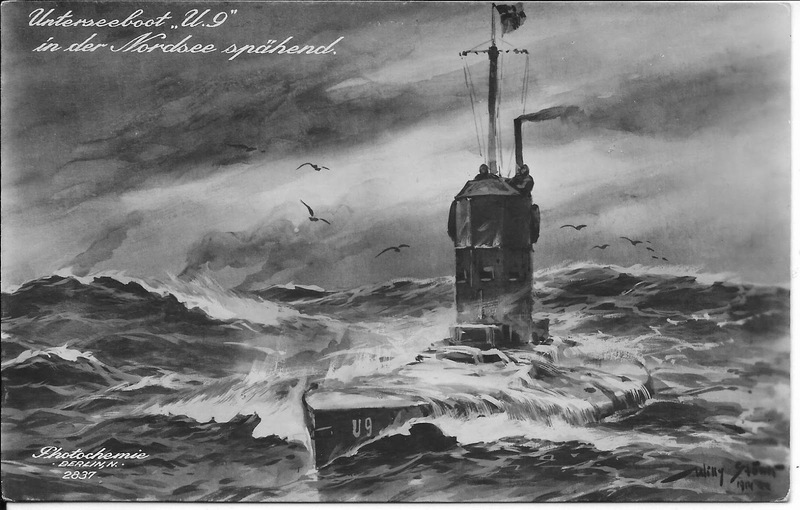 The U-9, having spotted British destroyers, but managing to escape detection, signalled news of her success when she reached the Ems Estuary. 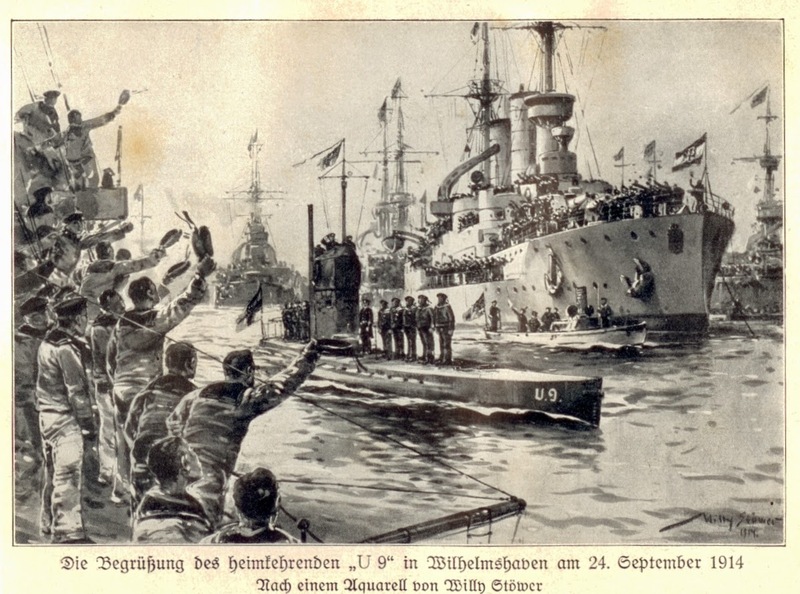 On September 24th U-9 entered the main German naval base at Wilhelmshaven to the cheers of the entire fleet. The crew were immediately national heroes and Weddingen was awarded the Iron Cross, First Class, as well as other decorations. Every member of the crew received the Iron Cross, Second Class. The lessons of the Pathfinder, Aboukir, Cressy and Hogue sinkings still did not appear to have been learned at the Admiralty. Six even-older old cruisers, the 10th Cruiser Squadron, were left patrolling off Aberdeen, on the North-East Scottish coast. 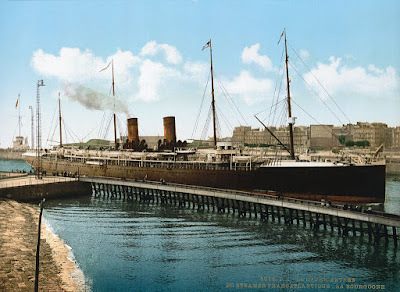 Among these was HMS Hawke, a protected cruiser of 7700 tons which dated from 1893 and was the survivor of a collision with the liner RMS Olympic in 1911. Kapitaenleutnant Weddingen was by now back at sea and on the morning of October 15th – three weeks after his previous exploit – he found Hawke and her sister Endymion stationary and transferring mail. 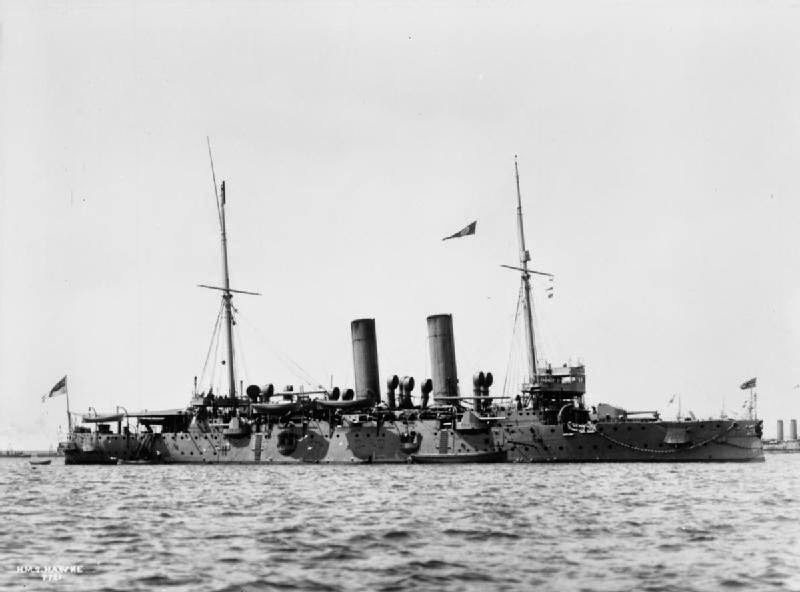 As Hawke got under way again – without zigzagging – Weddingen sank her with a single torpedo. 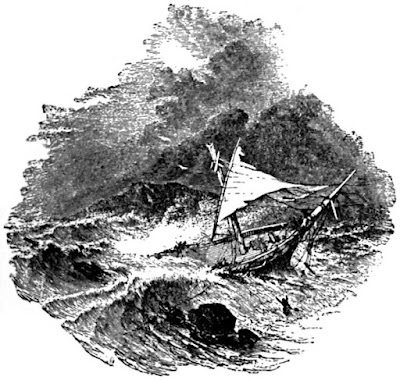 She capsized almost immediately and 524 of her crew died. Weddingen was appointed to command of the new submarine U-29 but his tenure was to be tragically short – U-29 was rammed by HMS Dreadnought in the Pentland Firth on 18 March 18th 1915.There were no survivors. Though the three ships lost in the Broad Fourteens were of little fighting value the impact on British public opinion was massive, not least because of the heavy loss of life. The numerous “artists’ impressions” of the sinkings which were published in illustrated magazines did nothing to understate the horror involved. German reports that the sinkings were the work of a single submarine and the Times newspaper speculated that an entire flotilla had been responsible, from which only the U-9 had returned safely. The subsequent court of inquiry attributed blame to all of the senior officers involved - Captain Drummond for not zigzagging and for not calling for destroyers and Rear Admiral Christian for not making it clear to Drummond that he could summon the destroyers. The most devastating criticism was of Rear Admiral Campbell, who had been Christian’s superior, and for whom the latter had been acting – at the inquiry he made the remarkable statement that he did not know what the purpose of his command was. The bulk of the blame was directed at the Admiralty for persisting with a patrol that was dangerous and of limited value against the advice of senior sea-going officers. The impact on neutral opinion was equally powerful. The supremacy of British naval power had been assumed ever since Trafalgar and was now suspect. 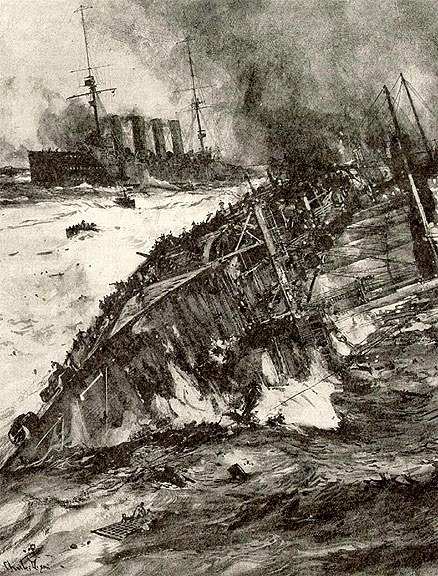 The First World War had opened badly at sea for Britain, and yet more disasters were imminent. But that’s another story. This volume of the Dawlish Chronicles has as its the background of the early development of the submarine and the role played by John Phillip Holland, the Irish-American inventor who was to make it a practical weapon of war. The first Royal Navy submarine was indeed named the Holland. Herein lies one of the great ironies of history, for Holland's initial funding came not from the British or American governments but from an Irish revolutionary society. 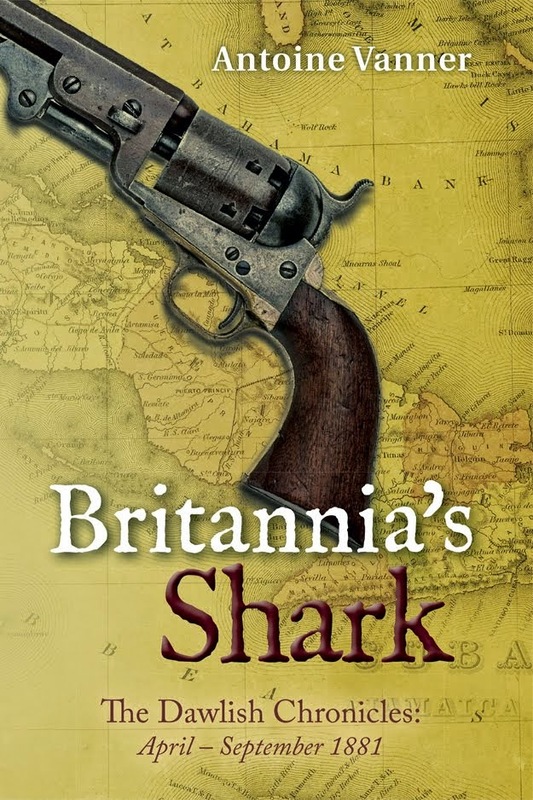 In Britannia's Shark a daring act of piracy draws the ambitious British naval officer, Nicholas Dawlish, into these machinations. Drawn in too is his wife Florence, for whom the glimpse of a half-forgotten face evokes memories of earlier tragedy. For both a nightmare lies ahead, made worse by a weakness Dawlish never suspected he had. Amid the wealth and squalor of America’s Gilded Age, and on a fever-ridden island ruled by savage tyranny, and manipulated ruthlessly from London by the shadowy Admiral Topcliffe, Nicholas and Florence Dawlish must make some very strange alliances if they are to survive – and prevail. Click on the cover image above to get more details. Subscribers to the Dawlish Chronicles mailing list receive a free, downloadable, copy of a new short story, Britannia's Eventide. If you have not already subscribed to the mailing list, you can do so by clicking here or on the banner above. The modern travel industry has brought tourists to just about every part of the world, however seemingly inaccessible. I suspect however that, though the island of St. Helena in the South Atlantic is widely known as the place of detention of the ex-Emperor Napoleon, very few tourists ever get there. I’m all the more glad therefore to welcome back my guest blogger, Lally Brown, has not only lived on the island, but has also put it to very good account in writing a very authoritative book about Napoleon’s exile there. You can find out more about Lally and her books at the end of her article, but first let’s hear here tell about one of the great “What Ifs...” of history. First of all a big "thank you" to Antoine for inviting me back to write another article for the Dawlish Chronicles blog, it’s both an honour and a real pleasure. 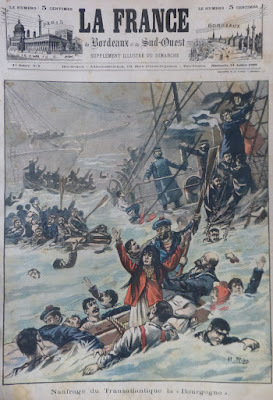 Like many other readers I was intrigued by Antoine’s excellent and informative post of 24th March 2016 concerning the Farfadet Submarine Disaster of 1905, and I was reminded of an extraordinary plot to rescue ex-Emperor Napoleon from his exile on remote St. Helena by submarine. Over the five and a half years of Napoleon’s imprisonment on the island of St. Helena several escape plans were hatched. Apparently Napoleon studied all of them but declined to risk any. Some were quite bizarre and some sound positively dangerous. Would Napoleon really have allowed himself to be dressed as a woman and smuggled on board a ship in Jamestown harbour? Or been lowered down a steep cliff in a basket in the dead of night? I think not! However the submarine plot, if true, must be the most hazardous of all the proposals. The submarine story is fascinating. 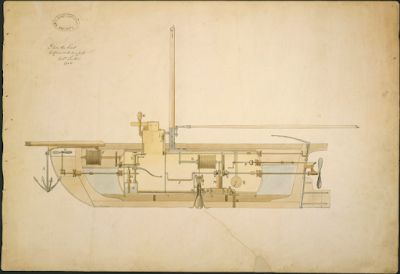 It starts late in 1797 when an American inventor living in Paris, Robert Fulton (1765-1815) took an original submarine drawing designed by a gentleman called Bushnell to the French government. By towing an underwater bomb, called a torpedo, Fulton was convinced his submarine (called Nautilus) could successfully ‘annihilate England’s Navy’. The idea was initially well received, but before construction could start, for some reason the project was cancelled. Possibly because Napoleon was busy elsewhere in Switzerland, Italy and Egypt. He submitted his report but in 1802 the Treaty of Amiens was signed and hostilities between France and Great Britain were halted and Napoleon lost interest in the submarine. Disappointed Fulton moved to England and approached the authorities there. 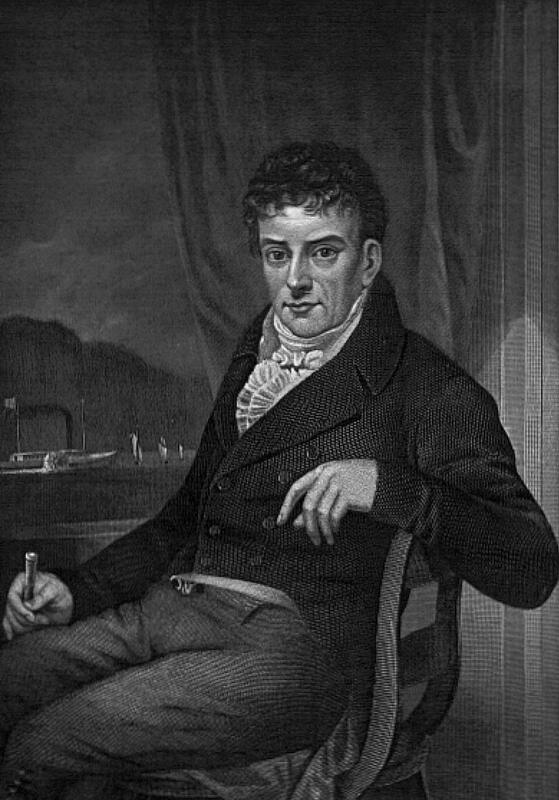 At first all seemed to be going well and Fulton began his experiments, but when the promised funds were not forthcoming Fulton left England for New York in 1806 in disgust. 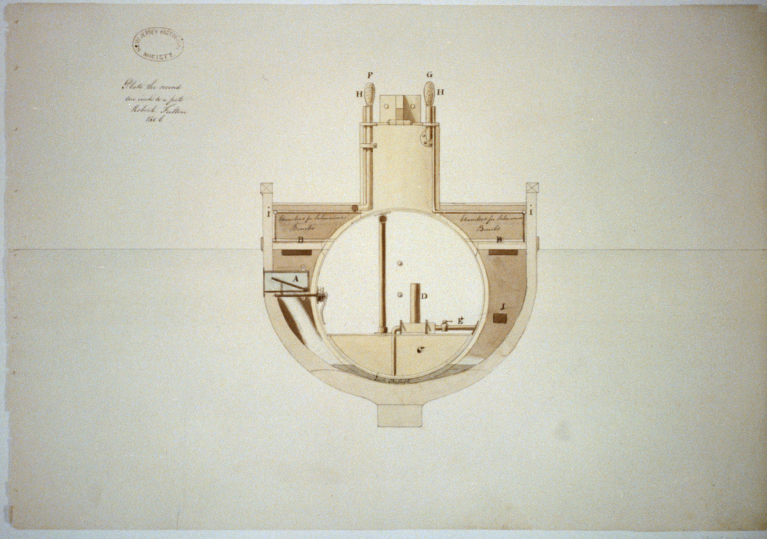 Unfortunately for the hapless Johnstone war with the U.S. ended in February 1815 and the submarine no longer held any interest for the British, funds were withdrawn and the project shelved. 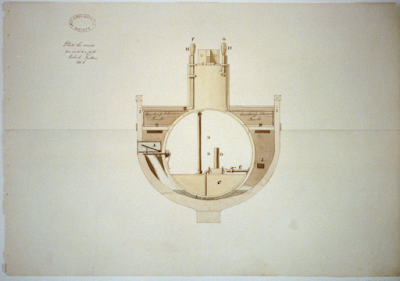 However, when Napoleon was banished into exile to the remote island of St. Helena after the Battle of Waterloo in 1815, it seems that Johnstone became convinced his submarine design could be used ‘in the meritorious and humane service of rescuing the immortal emperor Napoleon’ from his South Atlantic rock. Personally I think it highly unlikely that Napoleon would have considered escaping from St. Helena inside a submarine, but let Johnstone himself have the last word. Below is an account Johnstone apparently gave to Frederick William Naylor Bayley, who included it in his own memoirs published in 1835. Whether it is fact or fantasy still remains a mystery. 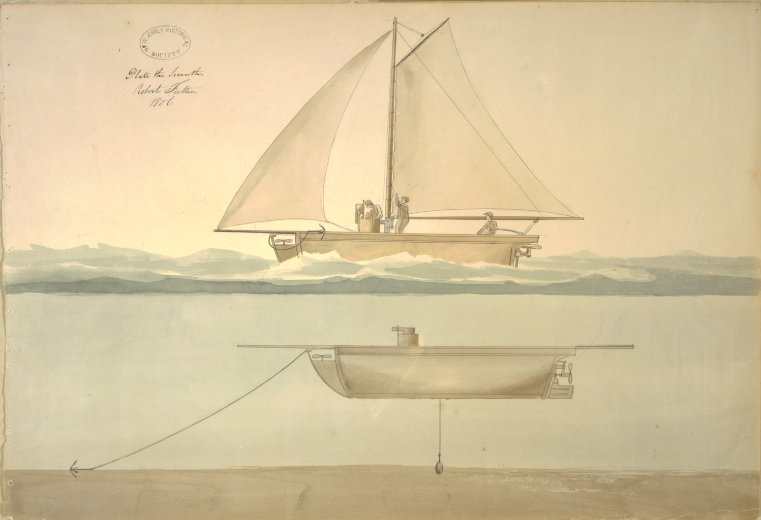 ‘I constructed two submarine ships, which I intended should be engaged in the meritorious and humane service of rescuing the immortal emperor Napoleon – the greatest man of his age – from the fangs of his jailor, Sir Hudson Lowe. The Eagle was of the burthen of a hundred and fourteen tons, eighty-four feet in length, and eighteen feet beam; propelled by two steam engines of forty horse power. The Etna – the smaller ship – was forty feet long, and ten feet beam; burthen, twenty-three tons. These two vessels would be propelled – the large one with two engines of twenty horse power each , the small one with one engine of ten horse power, high pressure, well arranged, equipped with warlike stores, and thirty well-chosen seamen, with four engineers. They were also to take twenty torpedoes, a number equal to the destruction of twenty ships, ready for action in case of my meeting with any opposition from the ships of war on the station. These two ships were to be stationed at a convenient distance from the rock (at St. Helena), abreast of Longwood House, the highest point of the island, being two thousand feet above the level of the sea, and because deemed inaccessible, of course unsuspected. All the accessible points were well fortified and guarded. In this position the two vessels were to lay at anchor at a cable’s length from each other, the smaller one close to the rock, well-fortified with cork fenders, in order to guard against any injury which might be apprehended from the friction or beating against the rock, which could at all times be prevented by hauling off or on, as occasion required. This smaller ship would be provided with a mechanical chair, capable of containing one person on the seat, and a standing foot-board at the back, so that the person at the back could regulate the ascent or descent at pleasure. 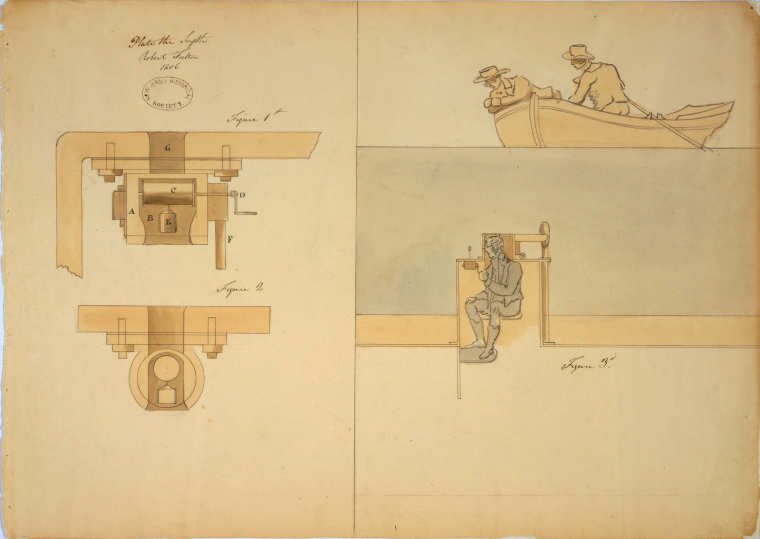 Attached to this chair would be a patent whale-line, two thousand and fifty feet long, with all the necessary apparatus ready when called for. Thus far arranged, the vessels were to remain submerged during the day, and at night approach the surface. Everything being then perfectly in order, I should then go on shore, provided with some other small articles, such as a ball of strong twine, an iron bolt, with a block, which I would sink into the ground at the top of the rock, opposite Longwood House, and abreast of the submarine ships. I should then obtain my introduction to his Imperial Majesty, and communicate my plan. The residence of the emperor being surrounded by a chevaux-de-frise, and the stables being outside, the servants only had access to the house. 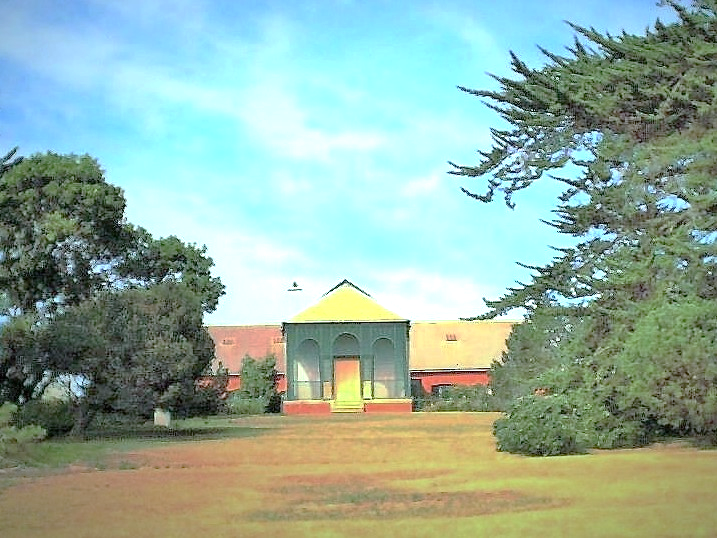 I proposed that the coachman should go into the house at a certain hour which should be fixed, and that His Majesty should be provided with a similar livery, as well as myself, the one in the character of coachman, the other as groom; and that thus disguised we should pass into the coach house, and there remain unnoticed and unperceived. We should then watch our opportunity to avoid the eye of the frigate guard, who seldom looked out in the direction of the highest point in the Island, and on our arriving at the spot where our blocks, &c. were deposited, I should make fast one end of my ball of twine to the ring, and heave the ball down to my confidential men, then on the lookout below, who would make the other end fast to the fall belonging to the mechanical chair, by which means I should be able to haul up the end of the fall, which I should run through the block, and then haul up the mechanical chair to the top. I should then place His Majesty in the chair, while I took my station at the back, and lowered away with a corresponding weight on the other side, until we arrived safe at the bottom. Embarked on board the Etna, into which we should have lowered, as it lay close under the rock, I should then cast off our moorings, and haul alongside the Eagle, and remain there during the day; in the evening, prepare our steam, and get underweigh as soon as it became dark. 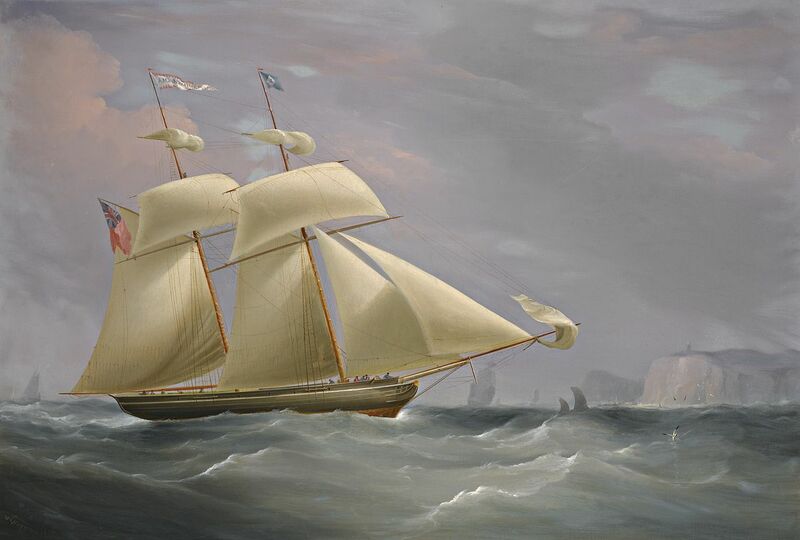 In this position I should propel by steam until I had given the island a good berth, and then ship our masts and make sail, steering for the United States. I calculated that no hostile ship or ships could impede our progress, so as to offer any very serious obstruction, as in the event of an attack I should haul our sails, and strike yards and masts (which would only occupy about forty minutes), and then submerge. Under water we should wait the approach of the enemy, and then, by the aid of the little Etna, attaching the torpedo to her bottom, effect her destruction in fifteen minutes. Napoleon died on St. Helena on 5th May 1821 but if he had succeeded in escaping from the island, by submarine or any other means, our history today might be very different. Those of you interested in learning more about Napoleon’s years on St. Helena might enjoy my book The Countess, Napoleon and St. Helena and anyone interested in the ‘what if Napoleon had escaped’ alternative history scenario will surely appreciate Shannon Selin’s book Napoleon in America. Born and bred in Yorkshire, England, Lally embraced the Swinging Sixties with naïve enthusiasm. As a teenager in search of adventure she trekked overland to war-torn Israel, working on a small kibbutz driving a tractor and picking oranges to earn her keep. She managed to hitch-hike around the country staying in Haifa, Jerusalem and Acre. This amazing, and occasionally dangerous experience, was the spark that ignited her lifelong love of adventure and travel. Lally has lost count of the number of homes she has had over the years but says her most memorable are those on remote St. Helena Island where ex-Emperor Napoleon Bonaparte was imprisoned and where he died; Montserrat in the Caribbean when the volcano erupted, Turks and Caicos Islands and the British Virgin Islands. As she looks back, Lally is writing about her adventurous life using the journals she kept at the time. Her books prove that truth can indeed be far stranger than fiction, with erupting volcanoes, hurricanes, earthquakes, evacuations, abduction, drug smugglers, people smugglers, armed robbery, hangings, stowaways, bribery, corruption, political intrigues, riots, and much, much, more. "A Piratical Proa in Full Chase": 19th C illustration by Charles Ellms. 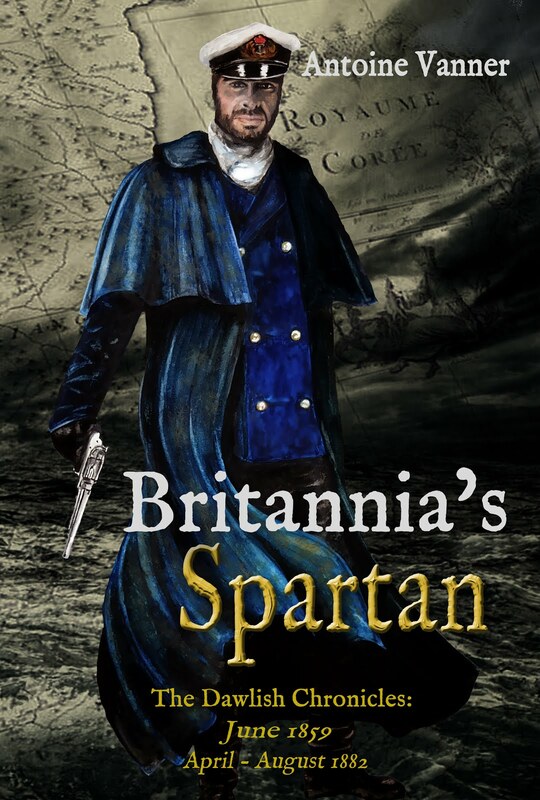 To thank subscribers to the Dawlish Chronicles mailing list, a free, downloadable, copy of a new short story, Britannia's Eventide has been sent to them as an e-mail attachment. 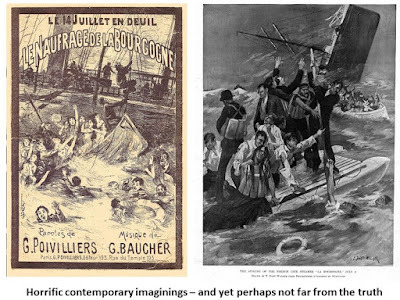 The sinking of the Titanic in 1912 remains locked in the public imagination as the supreme tragedy of North Atlantic passenger travel, all the more so since elementary safety precautions could have saved many more lives, even if they could not save the ship. What is however quite horrifying is that this disaster was preceded by so many others, with lesser but still substantial death tolls. The mantra so common today in the aftermaths of disasters – “Lessons must be learned” – was equally common in those years, but the lessons were not learned and preventive measure were not implemented. Provision of an adequate number of lifeboats was one obvious requirement, but so too was training and discipline of ships’ crews in the event of emergencies. The loss of the French liner La Bourgogne in 1898 was one of the most disgraceful of such disasters, the final death-toll being in no small measure due to the behaviour of a crew whose motto appears to have been “Women and Children Last”. MR. HAVELOCK WILSON MP: I beg to ask the President of the Board of Trade, whether his attention has been directed to the reports of a collision between the British steamship Ailsa and the French Transatlantic liner Bourgogne whether he is aware that the major portion of the crew of the Ailsa were foreigners, who immediately after the collision made a rush for the lifeboats, one of them striking a lady passenger and another kicking a lady in the side, and that they drew their knives and threatened the passengers; and afterwards took away the only available lifeboat, in spite of the protests of the captain; whether he will cause an immediate and full Inquiry to be held into the whole of the circumstances attending this collision; whether he can state if the crew of the Ailsa were competent seamen, able to speak and understand the English language; and, whether they were shipped in the United Kingdom or before Her Britannic Majesty's Consul at New York? Even allowing for the general distrust of “foreigners” – i.e. non-British citizens – was rampant at the time in Britain, the case seems egregious and indicates just how poor the safety standards and procedures on ocean-going shipping still were. It was the crew of La Bourgogne herself however that was to feature in an equally disgraceful manner two years later. The liner had been refitted in 1897-98, with a quadruple-expansion engine – then the gold standard – being installed. 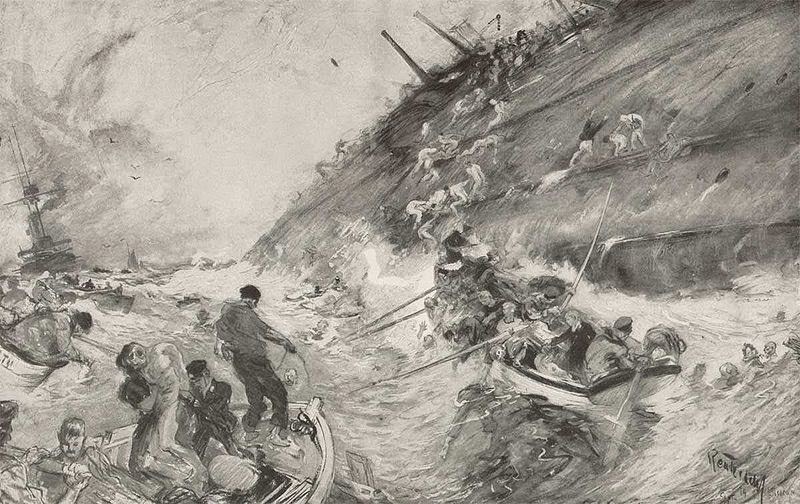 Shortly after re-entering service, on July 4th 1898, La Bourgogne ran into thick fog some hundred miles south of Nova Scotia at five in the morning. Also enveloped in the fog was the 1550-ton, 245-ft iron-hulled sailing vessel Cromartyshire. She was sounding her fog horn when a ship’s whistle announced the presence of another vessel close by – La Bourgogne. The Cromartyshire’s captain was unable to determine the location of the other ship until La Bourgogne’s starboard side loomed before him. There was no time for evasive action and the sailing vessel gouged into the liner’s side amidships, where many of the passengers were accommodated. La Bourgogne began to list immediately to starboard. Many of the lifeboats on that side had been wrecked in the collision and the boats on the port side proved impossible to launch due to the list. 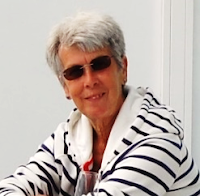 Even in this situation a disciplined response might have saved lives but La Bourgogne’s crew panicked and behaved as badly as that of the Ailsa had done two years before. Showing little concern for the passengers, they rushed for the undamaged boats and launched them. In the middle of this chaos, the Cromartyshire, damaged but not fatally, mistook alarm whistles and rockets from the again unseen La Bourgogne as an offer for assistance. Only as the fog thinned, and as the liner sank a half-hour later, was the actual nature of the disaster understood and the Cromartyshire began to pick up survivors from boats and improvised rafts. The death toll told its own story. Of 506 passengers on board La Bourgogne only 70 were rescued, as compared with 103 members of the crew out of a total of 220. Only three of the La Bourgogne’s eighteen officers survived, indicating that they at least had remained faithful to their responsibilities. Most telling of all is that only one woman survived and none of the children on board. Later reports, which may or may not have been true, indicated that crew members had stabbed passengers in the water, or had beaten them away with oars, to avoid the lifeboats being swamped. Public indignation was so high that La Bourgogne’s surviving crew members needed police protection when they landed at New York to save them from being lynched. Terrible as the Titanic’s loss may have been, her crew had nothing to reproach itself with in her final agony. The same cannot be said of La Bourgogne’s and their name will live in infamy. I’m rather flattered by a review today by author Meghan Holloway on her blog. 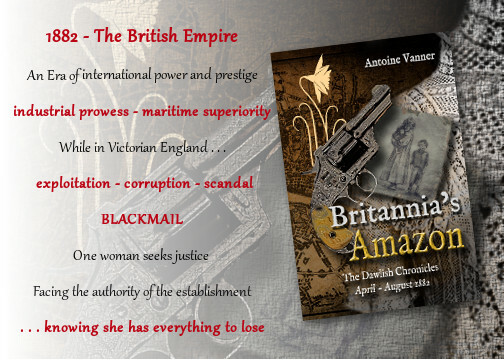 In it she writes that “Antoine Vanner's Britannia’s Amazon is a gripping read and features one of the most realistic heroines in historical fiction.” Click here to read her blog. I’m all the more pleased in that I had set myself a challenge, for the first time, of telling a story wholly from a female viewpoint. It's a dark tale, strongly linked to actual historical events and a particular concern was to reflect the constraints that late-Victorian society placed on intelligent, resourceful women. Click on the image below to read the opening chapters. My "Dawlish Chronicles" are set in the late 19th Century and reflect my deep interest in the politics, attitudes and technology of the period. 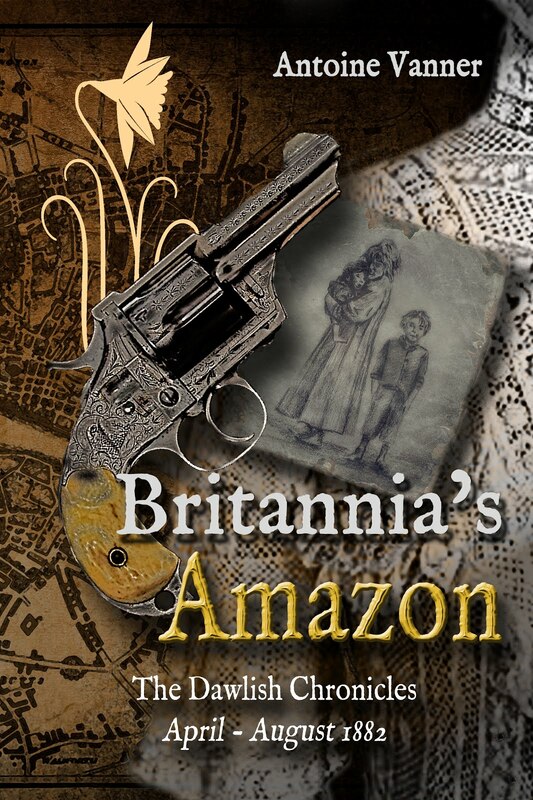 The fifth novel in the series, “Britannia’s Amazon” is now available in both paperback and Kindle formats. It follows the four earlier Dawlish Chronicles, "Britannia's Wolf", "Britannia's Reach”, "Britannia's Shark" and "Britannia's Spartan". Click on the book covers below to learn more or to purchase. I’ve had an adventurous career in the international energy industry and am proud of having worked in every continent except Antarctica. History is a driving passion in my life and I have travelled widely to visit sites of historical significance, many insights gained in this way being reflected in my writing. I welcome contact on Facebook and via this Blog. My website is www.dawlishchronicles.com and its “Conflict” section has a large number of articles on topics from the mid-18th Century to the early 20th Century. Sign below for updates about Dawlish Chronicles developments, free stories, discussions etc. 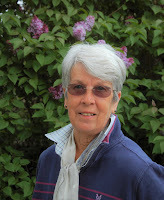 Janet Wertman | Writer of grants and historical fiction. Delivering interesting takes on the Tudors – and what it's like to write about them. Tribute to the dead infants of female convicts in Van Diemen's Land.